Summer has arrived here in Minnesota, allegedly on the 21st June, but the weather has been pretty uncharacteristic. We have had more rain (over 13-inches unofficially around Scott County) this month than almost any other June. I think it’s the 2cnd wettest June on record …and more rain in the forecast! So, the girls have been cooped up, with not much time to forage. We’ll dry up pretty soon, and then we’ll see how they do. Because when they can’t get out and fly, they get pretty cuh-rabby! In the meantime, Cindy and I got an email a couple of weeks ago from our local weekly newspaper, Prior Lake American. The reporter wanted to talk to us about the honey bees, and the Kickstarter. And it was hard for me to turn her down. Me?…talk about bees? OK! So we met Hannah at a local coffeeshop, talked about bees and things for about 45 minutes, and then took a ride out to New Market MN (where we have 7 hives). She got to wear Cindy’s bee suit and we opened up a couple of hives, so she could get a first-hand look inside! What a fun afternoon. Please follow this link to a recap of the email, and click the link there, which will open up a PDF of the newspaper article. We had fun with the interview, I hope you enjoy the article. Out of the 12 hives, we have 10 really strong ones going. I’m trying to figure out the best way to update each of you who have sponsored full hives, as well as “brood box sponsors”. With the rain, we have not been able to get out to the hives as often as I’d like, which has limited photo & video “opps”. Of the 12, eight of them have the honey supers on. Honey supers are shallower boxes than the brood boxes, and are separated from the brood boxes by a “Queen Excluder”. The queen Excluder is a screen which prevents the queen from getting through to lay eggs in the upper supers…so all that gets put in the cells up above, is honey. The honey supers are shallower so they won’t weigh as much when they’re full of honey. Ten deep (brood size) frames full of honey would weigh 90-100 pounds(40-45kg) , making those full boxes hard to handle. The honey supers when they’re full might weigh 35-40 pounds (15-18kg)…a little easier to get off the hive, and move around. The remaining four colonies without supers have not developed a strong enough population yet to be able to start filling honey supers “upstairs”. One queen is just a little slow, and the others are just a couple of weeks behind the others.They might get strong enough to pull honey off…but I’ll be satisfied if they build up enough population to go into winter. 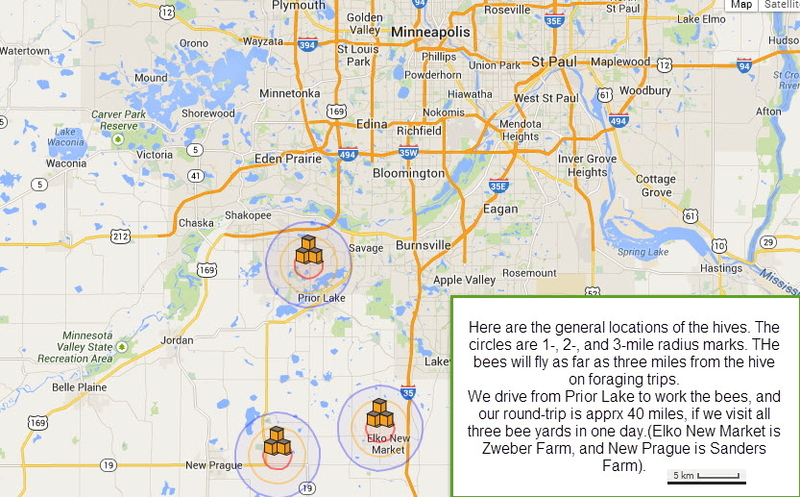 And here’s a map of our bee yards out in Scott County, MN. Click the image for a larger version. Hmmm. I want honey when you have it harvested!